It’s easy to visualize Sonny & the Sunsets playing some broken down, teenage pizza joint in 1964. Their flowery, sun-soaked harmonies, bubbly bass slaps and concise 2.5 minute 60s pop carries enough attitude and Brill Building hooks to drive those mop top youngsters stark raving mad. 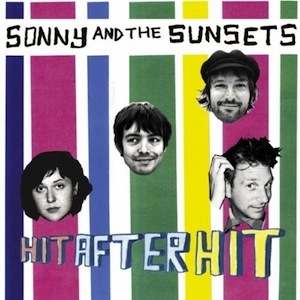 That said, San Francisco based Sonny Smith and his merry Sunsets draw their influences from a deep well of early 60s icons and other revivalists like Buddy Holly, a little Latin-tinge from Same Cooke and even Jonathan Richman. Though the real lesson from Hit After Hit is S&S’s devotion to a simple rock & roll formula mended to modern standards. “Don’t Act Dumb” leads with a rollicking drum intro and guitars then adds harmonies and keyboards which bleed into the chorus, “Girl, Don’t Act Dumb,” straightforward and effective. To the same effect is “Acres of Lust” and its spitfire, mostly instrumental balance. At a mere 31 minutes, the party is over too quickly. But, with each track as brilliant and honest as the next, Hit After Hit is exactly as advertised.